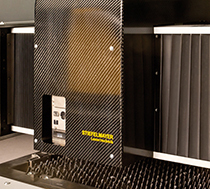 The best decision for efficient part manufacturing with the highest precision requirements. 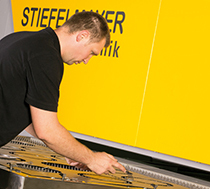 In the STIEFELMAYER effective L, state-of-the-art technologies and the unique table system combine to form a machine with the highest level of precision, dynamics and productivity. Sample service: Samples are always more expressive than any technical machine data, for in the end precision and productivity are what counts. Fibre lasers achieve a high level of absorption in metallic materials, they have an electrical-optical efficiency of approx. 30 % and offer outstanding beam quality. 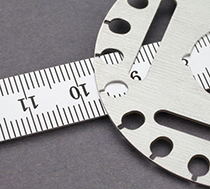 These characteristics allow cutting of metal alloys from steel, aluminium and copper. 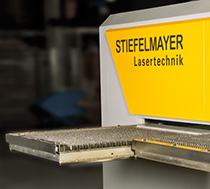 The solid base frame of the STIEFELMAYER effective L is welded from steel elements. To ensure long-term stability without warping, the elements are annealed to eliminate stresses. After annealing, processing with the highest precision provides the basis for the accuracy of the moving axes. Achieving the shortest possible production time for the manufacturing of complex, delicate parts requires the highest level of dynamics which is achieved through a reduction of the moved masses. On the STIEFELMAYER effective L, this was implemented by using lightweight carbon constructions for the moving Y-axis and its attachment parts. Two adjacent tables allow the highest level of flexibility, comfort and productivity. 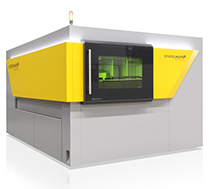 In individual operation, processing is carried out on a table size of 1250 mm x 1250 mm. In this mode, one table with completed lasered parts is moved out, unloaded and reloaded while the other table moves into the working position. The three sided access to the individual table offers particular ease of operation. Coupling the two tables achieves a table size of 2500 mm x 1250 mm. No other drive technology than linear motors is better suited for achieving the required dynamics and precision. It generates a direct, straight movement, allowing vibration-free transmission of forces into the moving parts of the machine. This enables the highest level of path accuracy with the highest level of dynamics. In addition to this, linear motors are mostly free from wear.